Drop me a line via email or call for a consult. Applying to college these days – writing the perfect personal statement and a dozen or more supplementals – can feel like mounting a presidential campaign. Parents have to make elaborate long-term plans, learn their way around campuses and financial aid forms, pay attention to a dozen deadlines, and have nerves of titanium. All of this while maintaining good relationships with their college-bound children – who are not children anymore. But nor are they exactly adults. It’s this in-between status that can make the college application process so fraught for so many families. Parents are often unfamiliar with this hyper-competitive system, and students, who may be just as unfamiliar, are sometimes certain they can figure everything out on their own. They might spend months discovering that they are not sure how to proceed after all. Ninety-percent of the inquiries I get are from parents calling for their children. The other ten percent are the students themselves – whether they’re writing from Cairo, London, Norman, Oklahoma, or around the corner from me in Manhattan. If you’re not sure how to help your child with his or her college application essays, please email me to talk about possibilities. 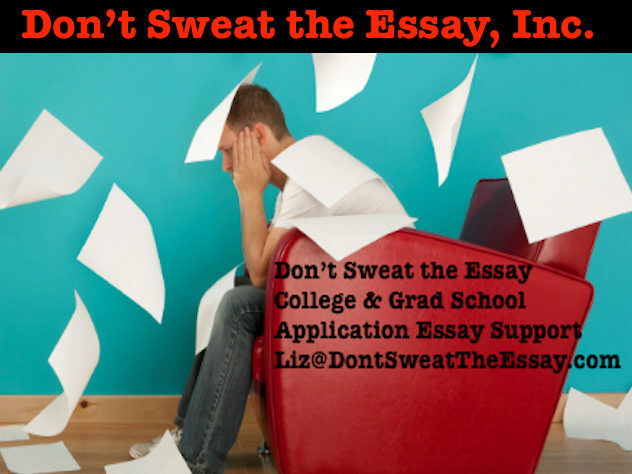 Liz@DontSweatTheEssay.com or call 1-855-99-ESSAY (East Coast time).